Wooden barrels line one wall at Mad River Brewery, where Dylan Schatz is making a bourbon-barrel-aged vanilla porter. Nobody ever told bourbon makers about zero waste. They're a peculiar lot, holed up in Kentucky, stacking charred bourbon barrels by the millions into drafty, seven-story warehouses — and then getting rid of every single barrel. There is no particular reason to jettison each barrel after a single use, says Josh Hafer, my go-to bourbon guy. Except, well, it's a federal regulation. Single-use barrels were a bourbon tradition before the reg was written, Hafer says, but now, basically, it's the law. The fun I'm having imagining this regulation's birth is almost better than a good, rich autumn beer. Who said what to whom, when? Was it over sweet, strong drinks in some corruptly genteel parlor? Whose soft Southern syllables wrapped themselves around what honeysuckle quid pro quo? Mmmm. Just savor this a minute, imagining. OK, now back to beer. Two of our three biggest Humboldt brewers are releasing bourbon-barrel-aged beers this fall. Both used barrels from the same distillery, Heaven Hill Brands, which is what brought me to Hafer, the company's communications manager. Heaven Hill is the world's second-largest bourbon seller, right behind Jim Beam. Its barrels were once reused mostly by makers of Scotch whisky, Hafer tells me, but now, increasingly, they're also snapped up by breweries. Brewers can have different reasons for barrel aging a beer. Sometimes they want flavors from the microflora in the barrel. That's a path toward sours and saisons, styles that will get a column all their own later on. At other times, brewers want a beer that picks up flavor from the wood itself or what it once held, anything from bourbon to tequila. The variations can be endless. Jacob Pressey of Humboldt Regeneration Brewery and Farm often ages his beers in new barrels. "I like the oak character in beer," he says. "It gives it a spicy vanilla character." 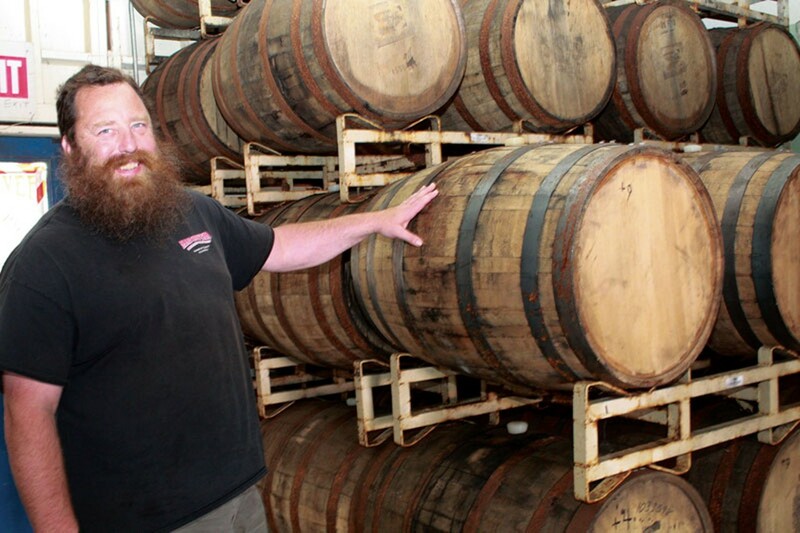 At Mad River Brewing Co., brewmaster Dylan Schatz recently filled Heaven Hill bourbon barrels with porter and then added vanilla beans. The barrels will age for two months to create his Bourbon Barrel Vanilla Porter. When any beer ages, even in a glass bottle, oxidation changes its flavors as some compounds break down and new ones form. (In many beers, nothing good emerges from this.) For barrel aging, brewers choose beers they expect to morph and mellow wonderfully during the oxidative process. So really, three things are going on in a bourbon barrel-aged beer. The beer itself changes with age. It picks up wood flavors (vanilla and oak). And it picks up the flavor of the bourbon that has interacted for years with expanding and contracting wood, adding its own sweet, toasty richness. This is a great season to explore Humboldt's barrel-aged beers. The weather is shifting, setting the stage for porters and stouts that often age well, and some notable new releases are coming up. For its 20th anniversary, Eel River Brewing Co. has aged its award-winning Triple Exultation for six months in Heaven Hill bourbon barrels. For the first time, this barrel-aged beer is being released in 22-ounce bottles, as well as on tap in Fortuna. I love this, because at home or in the brewpub, you can taste the barrel-aged version my favorite way: side by side with the same beer, unaged. If you can, do this with any barrel-aged beer you try. It's a fascinating way to appreciate exactly what the barrel — and time — has done to a beer. When you sip both Triple Exultations during the same session, it's easy to pick up the hoppier notes of the original, as well as the sweet, boozy complexity of the aged version. Mad River Brewery's new batch of Bourbon Barrel Vanilla Porter will also be ready soon, along with a Port Barrel Aged John Barleycorn Barleywine in October. If you're stocking your fridge, pick up Mad River's regular porter to try alongside a 22-ounce bottle of the vanilla-bourbon version. Once you've discovered which barrel-aged beer you like best, ask your favorite brewer how long the bottled ones will keep. Some will mature and improve for years. If you can resist drinking them. Thursday, Oct. 1: Randall Redux. Humboldt Regeneration will use the Randall ("Humboldt on Tap," June 18), an infusion chamber for adding fresh flavors just before serving, to infuse its biscuit wheat beer with apples, pears and charred oak chips soaked in Jameson whiskey. On tap for the first week or two of October. Sunday Oct. 4, 8 a.m.: What goes better than beer with competitive disc tossing? Breakfast, lunch, AND beer. All are included at the 17th annual Brewer's Cup, a disc golf competition that pairs random doubles to tackle the Mad River disc golf course on Warren Creek Road. Late registration starts at 8 a.m.; play begins at 8:30 or 9 a.m. Call Dutch Sullivan at 845-3638 to pre-register. $35. Saturday, Oct. 10, 12:30-5 p.m.: Smaller than Hops in Humboldt, less weird than StrangeBrew, Hoptoberfest pops up handily in October, just when you're getting thirsty. In Blue Lake's Perigot Park, sample 25 to 30 different beers from 12 breweries, plus plenty of hard cider at this family-friendly benefit for the Blue Lake Education Foundation. Taps open at 1 p.m. $25 presale; $30 at the gate; $5 non-drinkers; kids 12 and under free. Thursday, Oct. 15: Dead Reckoning devotes five taps to a Shiga Kogen mini-tap-takeover. Expect two IPAs, a saison, an anniversary ale and a brown ale from this Japanese brewery, whose craft beers can be hard to find in America. Thursday, Nov. 5 (and every first Thursday) 7 p.m.: Sample and compare notes with Humboldt Homebrewers at the club's monthly meeting at Humboldt Beer Works in Eureka. Free to attend; club dues $20 annually. Send your beer news to Carrie Peyton Dahlberg at beerstainednotebook@gmail.com.